What are vinyl cut stickers? •	Vinyl cut stickers are cut to shape, this eliminates the need for printing inks and background material. Vinyl cut stickers are also called Computer Cut Decals and Die-Cut Decals. •	Vinyl cut stickers create a professional appearance for signs, windows, cars, trucks, boats industrial & commercial equipment, in fact you can apply vinyl decals to any clean smooth surface, so are great across many applications. We provide vinyl cut stickers on pre-spaced and pre-masked sheet for an easy, quick and professional application. 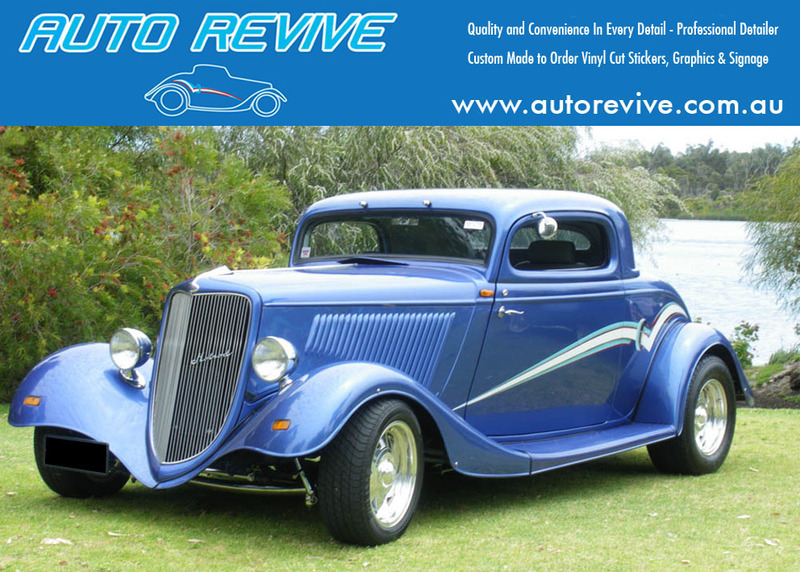 •	Depending on the vinyl used, they have an outdoor life from 5 year up to 8 years.Auto Revive uses a vinyl that’s rated up to 8 years outdoors continuously. How do I apply the vinyl cut stickers? •	All orders for vinyl cut stickers come with application instructions, you can also download a PDF file application Instructions. Are vinyl cut stickers reusable ? •	No. Removing vinyl cut stickers will cause them to stretch and tear. Do vinyl cut stickers wash off? •	No. Car washes and pressure washers are safe on stickers, but do take care when using high pressure hoses on the edges of the sticker. Where can vinyl cut stickers be used? •	On any smooth & clean surface with limited curves. Will the vinyl cut sticker fade over time? •	No. Vinyl is not printed, it is dyed and cannot fade however it will break down over time with prolonged exposure to the sun. Will wax affect the vinyl cut sticker? •	No, but when applying the wax, apply it by hand and avoid using electric buffers. Will the windscreen wipers affect vinyl cut stickers? •	Yes on Rear windows, Better not to use them. Can you make multiple colour vinyl cut sticker? •	Yes, using layered vinyl colours, vinyl cut stickers can be made in multiple colours, however, this is considerably more expensive as there are more materials and labour involved. Do you have colours other than what is listed on your site? •	Yes. we do not stock basic colors, but can get them in for an additional cost. Are the vinyl cut stickers weather proof? •	Yes. vinyl cut stickers are not affected by rain, hail, snow, salt or hot and cold temperatures. If I remove a vinyl cut stickers, will it damage my paint or clear coat? •	No. The vinyl cut sticker will actually protect the paintwork. Do vinyl cut stickers affect window tint? •	No. Window tint is on the inside of the glass, vinyl cut stickers are on the outside. However, it is not recommend that you apply the vinyl cut sticker directly onto the tint if applying the vinyl cut sticker on the inside of the glass. How do I remove bubbles after installation? •	Most bubbles will disappear within a few weeks, if there are any remaining, use a pin to pierce the bubbles and use your finger to press the air out. Can I install vinyl cut stickers on fresh paint? •	It is recommended that paint is left for at least 1 month be applying vinyl cut stickers. Can I clear coat over my vinyl cut stickers? •	No Need as most vinyl is Gloss unless can get in Flat Black and Flat White. Vinyl is a good bit cheaper to do, hence the need to save my money. Paint fades unless you keep it polished often. It easy to replace a letter if it gets scratched with vinyl. Vinyl is final……..Once the paint starts to fade it looks awful. If you sell you boat but want to keep the name its much easier to remove the vinyl. Vinyl – Better for resale as it comes off for any new owner. Ive said it before, if I didnt like the name of a boat and it was painted on I would look elsewhere. There is always another boat. smooth edges no bleed out.